It was nearly two weeks ago. A Saturday. I had just left JJ’s barbeque and was catching an evening train down to Barham. The day was damp and drizzly and the tube and station were crawling with the strident remnants of a football match. I made my way along the platform, searching for a compartment away from the slurped beer cans, vacant stares and match minutiae. I found one and ducked in. An empty four-seater. I grabbed the preferred window seat, back to the wall, facing forwards. 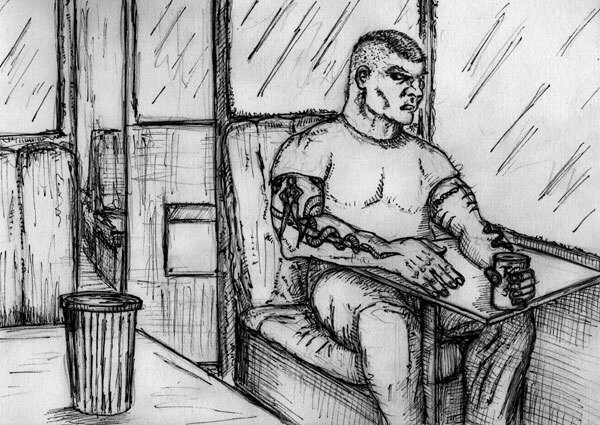 A large man with tattooed biceps sat across the aisle. But he was sober and quiet and alone. There were a scattering of other occupants but I could deal with them. I settled back. People continued to filter in but most headed up into the carriage. A sudden little swell of travellers squeezed in just before we were due to disembark. I looked up, hoping to be left alone. An older gentleman stepped towards me. I had a moment to scrutinise him before he slid into the seat opposite. He was well if casually dressed in linen jacket, white shirt and grey flannels. His lined face was tanned from an English sun and he had a noble, interesting air about him. My resentment at having to share the space vanished. I was surprised at being addressed. I was unshaven. I was wearing combats and an old jumper. My Swiss Army backpack occupied the seat next to mine. 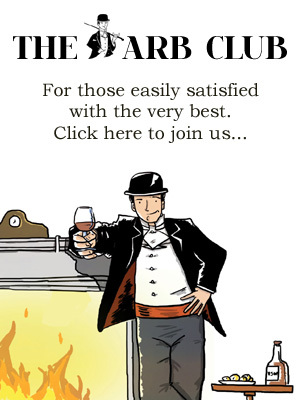 I felt scruffy; a bit of a ruffian, particularly in comparison with his neatly cut and pressed apparel. I was used to London wariness, especially when it came to women and the old. Or was it me that was wary? I glanced at the tattooed hulk across the way. I was self-conscious. 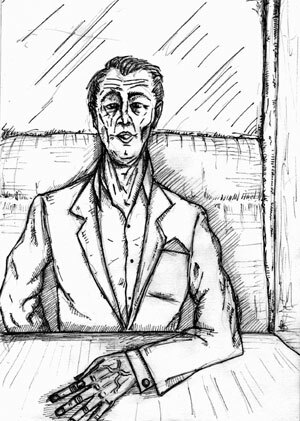 Conversation between strangers in an open carriage – it was unusual and a little disconcerting. But the hulk seemed disinterested. And that was it; we were talking. What a relief to turn and speak openly to my fellow man. Two ‘Strangers on a Train,’ but nevertheless, like that Hitchcock film, I carried a grain of distrust with me. What was he really after? He had seen me as he stepped through the doors and seemed to make a beeline for me. Could it be that he simply and innocently liked the look of me, as I did of him, as we are drawn to certain people, and make friends of them? As we talked I began to put together a picture of him, not only through what he told me, but how he told me, how he used his hands, what his hands looked like, his face, eyes, clothes and physique. He had worked for Natwest bank, first in London, then in Brighton, which he commuted to from Eastbourne, where his parents had lived and where I imagined, he had grown up. I guessed because of his bearing and his cultivated and intelligent air, that he’d been fairly high up this establishment. I put his age at about sixty-seven; he had that sturdiness that active men in their sixties can still retain, before the seventies brings that inevitable dip into old age. But you can learn as much about a person in what they don’t say. He made no mention of a wife, or children. I was jolted out of my reverie of enjoyment. My grain of distrust multiplied. Exercise is a manly enough topic and fairly neutral in most hands, but when one is asked point blank in such circumstances, by a new acquaintance, if one exercises, then there is a distinct whiff of cottager in the air. Was my grey-haired companion in fact some homosexual roué, a gluttonous voluptuary who had alighted on me as prey and was now sizing me up to determine the leanness of my flesh? The thought of a sixty-seven year old pumping iron was curious and not altogether agreeable. And who was this mysterious friend who used to partner him at the pool? Fortunately we didn’t dally in the arena of bench flies and lap times but the talk of swimming led to bathing in ponds, lakes, the sea, and cycling led to escaping out of doors and suddenly I was relating my six-day tramp on the Downs, and I could breathe again. He was a walker too. He knew the Cuillin Hills in Skye and was off to Galloway the next weekend to go walking with friends (one who was evidently married, not that it meant much particularly). He knew Corsica also and soon our talk of the outdoors turned to talk of its past – when the British had occupied the island, Napoleon and the Genoese influence. We talked on with energy and pleasure, delighting in the fact that we were spending a journey with someone who shared the same sense of openness and curiosity about the world. Did it, after all, matter that he might be gay and interested in me because of this? He might be married or a widower for all I knew. What was fact, though, was that he was cultured and well travelled; a man of action for his age, and good company. Religion was next. It crept up sneakily, but at my insistence it stayed. It turned out that the annual general meeting he had attended in the role of treasurer was for the Baptist History Society. He was reticent at first, to the point of faint embarrassment, in the charming, slightly childish way the English can be when talking of their own religion. But I spurred him on, and soon he was relating a potted history of the Baptists, from their inception as a group of renegade non-conformists at the time of the reformation who set up a colony in Holland before returning during the Civil War when there was an explosion of such similar groups like the Levellers. They were a non-liturgical denomination whose hierarchy was broken down, the Pastor being effectively chosen by the parishioners. From here I interrogated him about the Methodists who were similarly non-conformist and who had sprung from Wesley’s inspirational teaching in the eighteenth century. Both groups had plain unadorned churches which befitted their stripped down approach to religion. My father in the past had sometimes attended services, particularly if he found the neighbouring Anglican church dull, and he had often praised their roistering services. By coincidence, I later found out that my great-grandfather on his side had been a Baptist. The guard announced that the next station would be Lewes. I looked up and saw the dark outline of the Downs blocking out the horizon. I got to my feet. My companion looked up at me, a little startled, alone, an old man again. “Perhaps we could meet for a coffee sometime in London?” he asked. “Yes,” I murmured as the dark shadow of suspicion once more flashed over my mind. I fumbled with my phone but couldn’t get the damn thing to cooperate. The train brakes screeched as we ground into the station. He groped for a piece of paper in a plastic file, somewhat desperately I thought. 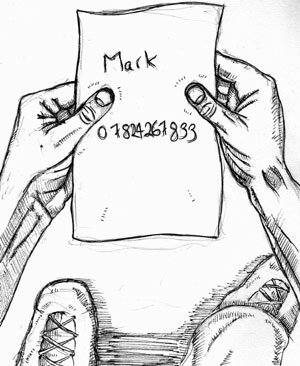 He handed me a slip of paper with a mobile number scrawled across it in spidery hand, and his name, Mark. It looked wrong somehow, too informal, and it didn’t tell the whole story, only half of it. “It was great to meet you.” I shook his hand hurriedly and jumped clear. 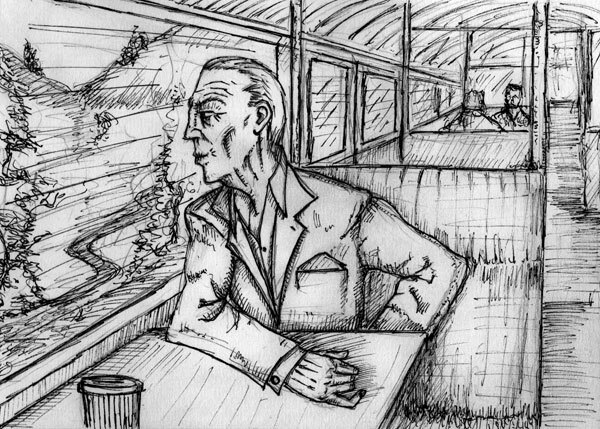 As I walked off along the platform and the train rumbled off into the night, I drew the crumpled piece of paper out of my pocket. And a sadness overtook me, because I knew I would never call that number. Written and illustrated by Harry Chapman. I enjoyed this post very much, and have had the same experience but mostly on airplanes. I can think of two instances on transatlantic flights meeting people of very different walks of life, but enjoying visiting with them as you did here. This is one of the best aspects of travel. Thank you for sharing the story. Rail, of course; is the most contemplative and romantic mode of travel! Thanks for the feedback and your kind words. You’re absolutely right when you say the casual encounter is one of the best aspects of travel. A certain intimacy can spring up very quickly between strangers, born I think of both of you being out of your backyard environments and also the sense that you have nothing to lose – you may never see that person again. There’s no emotional baggage with strangers which can lead to some surprising bouts of honesty. As you also rightly point out, the history and culture of rail travel lends itself to such encounters.